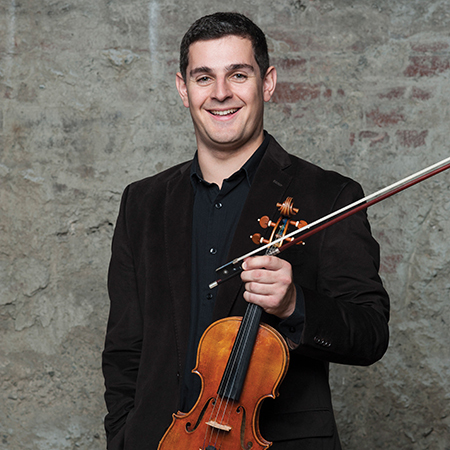 Concertmaster of the Vancouver Symphony Orchestra, Nicholas Wright is a native of England. His engagements as soloist, chamber and orchestral musician have taken him to most of the major concert halls in Europe, Asia and North America. He has performed concertos with orchestras worldwide including the BBC Concert Orchestra, the Royal Oman Symphony and the Vancouver Symphony Orchestra. His repertoire spans works from Handel to premieres by composers such as Kelly-Marie Murphy and Jocelyn Morlock, whose works he recently recorded for the Naxos label. He made his solo debut with the York Guildhall Orchestra playing the Dvořák Romance, which was recorded for BBC Radio 3. His concerts and recordings have also been featured on CBC Radio (Canada) and Radio 4 (Hong Kong). As an orchestral musician, Nicholas has worked with the world’s most renowned conductors including Bernard Haitink, Sir Simon Rattle, Valery Gergiev and Mstislav Rostropovich. He has performed extensively with the major chamber and symphony orchestras in London including the English Chamber and London Philharmonic Orchestras, and has appeared as guest concertmaster with orchestras such as the Bournemouth Symphony, BBC Concert and Ulster Orchestras. In 2003, he was appointed as the youngest member of the London Symphony Orchestra where he held the first violin sub-principal position, and in addition collaborated with film composers John Williams and Alexandre Desplat. As a chamber musician Nicholas regularly takes part in series such as the Mainly Mozart Festival, Ribble Valley Festival, LSO and VSO chamber players and Vancouver’s Music on Main. He has performed in venues such as LSO St Luke’s and has collaborated with many renowned artists including Martin Roscoe and Simon Wright. Prior to his appointment as concertmaster of the VSO, he was first violinist of the critically acclaimed Vancouver based Koerner Quartet. Nicholas received his training as a scholar at the Royal College of Music in London, studying with Itzhak Rashkovsky and Rodney Friend. In addition to winning prizes at the Royal College, Nicholas has been generously supported by grants from the Martin Musical Fund, the Craxton Memorial Fund and the Royal Overseas League. This has enabled him to study with many eminent musicians including Ruggiero Ricci and Gil Shaham. Nicholas enjoys teaching and has given many masterclasses internationally. He is on the faculty of the VSO School of Music. Nicholas plays on a violin by Stefan-Peter Greiner.